An actor, singer, dancer, musician and food enthusiast who is currently playing Hamish in Silvertop Ash at Gasworks as part of the Midsumma Festival. I can’t imagine doing anything differently, this is all I’ve ever wanted to do. But since you’re twisting my arm… I’d love to be a professional football (soccer) player; my 4 year old self would love that! People who have an unbridled love and passion for what they do & who they are, particularly people in the arts. More specifically I’m really inspired at the moment by Benedict Cumberbatch. You could say I’m a bit of a Cumberb*tch. He is so classy and has such fluidity in his performances. He’s part of a wonderful group of actors who have spent time at the National Theatre and the RSC in the UK who I really admire and who keep me striving to learn more about my craft. I’m just gonna keep doing what I’m doing; making theatre, making music, making people happy & doing things that mean something to me. Theatre and the arts can make such a difference to people’s lives so as long as I keep doing it, hopefully the more of a difference I can make. New York! My first time there was in the middle of Winter in 2011. Everything that you imagine a white winter in New York City being; it was. Absolutely breathtaking. I then spent 8 weeks there in the summer of 2012, starting off as a tourist, then becoming a student and by the end I felt like a local; my local Starbucks even knew my name and my order! I made lifelong friends there and I can’t wait to go back! I love going up the Eureka Tower at sunset on a beautiful summer’s day. I’ve done this a few times with friends visiting from overseas and it’s such a great way to view this great city. A wonderful Australian play by a very talented Playwright; Silvertop Ash by Wayne Tunks! Steven Pasquale singing It All Fades Away from The Bridges of Madison County. What an incredibly powerful voice! Is spending an afternoon cooking or baking in the kitchen with my girlfriend, then sitting down and sharing what we’ve made with our family and friends. I suppose it’s also knowing that I’m lucky enough to be making a living doing what I love! Who knows?! I’m learning to enjoy what I have right now! I think that’s really important! There’s no point stressing about what the future has in store! Hopefully it’s something and somewhere exciting, challenging and with people I love! James Coley was most recently seen in the Victorian & Tasmanian tour of Barassi playing the young Ron Barassi. 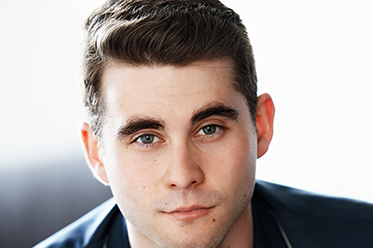 He graduated from the Arts Academy, University of Ballarat – Musical Theatre in 2013. Prior to Ballarat, James trained at the Victorian College of the Arts Secondary School in Trumpet and Voice. In 2012, James travelled to New York City to train at CAP21, one of the city’s top musical theatre conservatories. While at the Arts Academy, James played the lead role of Billy Lawlor in 42nd Street as well as featuring in Parade (Old Soldier) and A Little Touch of Chaos (Man in Black/Arthur u/s). Other credits include the Australian Shakespeare Company’s production of A Midsummer Night’s Dream (Nick Bottom). James is currently appearing in Silvertop Ash at the Gasworks Arts Park Theatre until 31 January. For more information, visit: www.midsumma.org.au for details.